Not to be confused with Hot Springs, Arkansas. Hot Spring County Courthouse, Malvern. 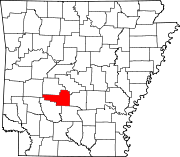 Hot Spring County is a county located in the U.S. state of Arkansas. As of the 2010 census, the population was 32,923. The county seat is Malvern. Hot Spring County was formed on November 2, 1829, from a portion of Clark County. It was named for the hot springs at Hot Springs, Arkansas, which were within its boundaries until Garland County was formed in 1874. It is an alcohol prohibition or dry county. Hot Spring County comprises the Malvern, AR Micropolitan Statistical Area, which is included in the Hot Springs-Malvern, AR Combined Statistical Area. Hot Spring County is represented in the Arkansas State Senate by Republican Alan Clark, a Hot Springs businessman. In the Arkansas House of Representatives, it is represented by a Republican as well, Laurie Rushing, a real estate broker from Hot Springs. According to the U.S. Census Bureau, the county has a total area of 622 square miles (1,610 km2), of which 615 square miles (1,590 km2) is land and 7.0 square miles (18 km2) (1.1%) is water. As of the 2000 United States Census, there were 30,353 people, 12,004 households, and 8,834 families residing in the county. The population density was 49 people per square mile (19/km²). There were 13,384 housing units at an average density of 22 per square mile (8/km²). The racial makeup of the county was 87.33% White, 10.26% Black or African American, 0.45% Native American, 0.22% Asian, 0.04% Pacific Islander, 0.44% from other races, and 1.26% from two or more races. 1.27% of the population were Hispanic or Latino of any race. There were 12,004 households out of which 31.80% had children under the age of 18 living with them, 59.20% were married couples living together, 10.60% had a female householder with no husband present, and 26.40% were non-families. 23.50% of all households were made up of individuals and 11.10% had someone living alone who was 65 years of age or older. The average household size was 2.50 and the average family size was 2.94. In the county the population was spread out with 25.10% under the age of 18, 8.20% from 18 to 24, 26.50% from 25 to 44, 24.50% from 45 to 64, and 15.80% who were 65 years of age or older. The median age was 38 years. For every 100 females there were 95.50 males. For every 100 females age 18 and over, there were 93.00 males. The median income for a household in the county was $31,543, and the median income for a family was $37,077. Males had a median income of $27,800 versus $19,461 for females. The per capita income for the county was $15,216. About 10.30% of families and 14.00% of the population were below the poverty line, including 19.00% of those under age 18 and 14.20% of those age 65 or over. Townships in Arkansas are the divisions of a county. Each township includes unincorporated areas and some may have incorporated towns or cities within part of their space. Townships have limited purposes in modern times. However, the US Census does list Arkansas population based on townships (often referred to as "minor civil divisions"). Townships are also of value for historical purposes in terms of genealogical research. Each town or city is within one or more townships in an Arkansas county based on census maps. The townships of Hot Spring County are listed below with the town(s) and/or city that are fully or partially inside them listed in parentheses. ^ a b "State & County QuickFacts". United States Census Bureau. http://quickfacts.census.gov/qfd/states/05/05059.html. Retrieved May 21, 2014. ^ U. S. Census Bureau. 2011 Boundary and Annexation Survey (BAS): Hot Spring County, AR (Map). http://www2.census.gov/geo/pvs/bas/bas11/st05_ar/cou/c05059_hot_spring/BAS11C20505900000_000.pdf. Retrieved 2011-08-18. ^ "Arkansas: 2010 Census Block Maps - County Subdivision". United States Census Bureau. http://www.census.gov/geo/maps-data/maps/block/2010/cousub/dc10blk_st05_cousub.html#H. Retrieved May 29, 2014. ^ "Summary Population and Housing Characteristics, CPH-1-5, Arkansas" (PDF). Census of Population and Housing. United States Census Bureau. September 2012. http://www.census.gov/prod/cen2010/cph-1-5.pdf. Retrieved May 31, 2014. Gerdes, Edward G. (2002). "Third Arkansas Regiment Infantry, CSA: Company F — "Hot Spring Hornets"". Bill Couch. http://www.couchgenweb.com/civilwar/3rdcof.html. This page uses content from the English language Wikipedia. The original content was at Hot Spring County, Arkansas. The list of authors can be seen in the page history. As with this Familypedia wiki, the content of Wikipedia is available under the Creative Commons License.